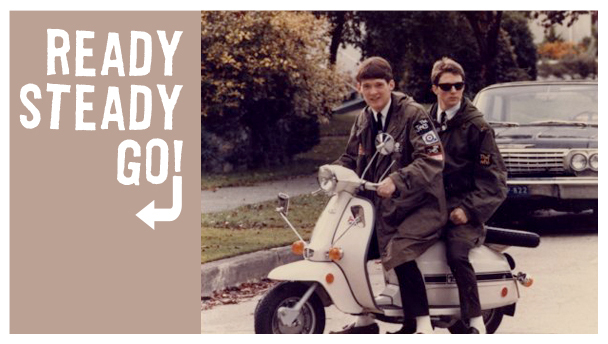 Mod Style: Ready, Steady, Go! Mods came from the working class teenagers in London in the late 1950’s. In the mid sixties it began to wind down making way for the hippie movement. It was a stylish group whose music tastes where rooted in jazz and rhythm & blues. The Who was a very popular band from the early Sixties. It was rumored that they changed their name from High Numbers to The Who because people were often heard saying, “Who’s playing.” Seeing as the name was sticking, they decided to go with The Who. A small list of music that captures the energy includes Lulu, Otis Redding, BB King, The Jam and Small Faces. Fashion played a large part the scene. Italian motor scooters, Vespas and Lambrettas, where the must have of transportation. An individual look was preferred attained by accessories and mirrors. Usually a fishtail US Army parka was worn when riding to protect the clothing underneath. This group was focused on all things current with Art, Music and Style. Although official all things mod had gone with the sixties a film came out in 1979 that played a huge part in the revival of the era. The cult classic Quadrophenia (originally a rock opera from The Who) amplified the Mod lifestyle. Both rockers and Mods enjoyed the film in part because of the climax scene at Brighton Beach. The two groups engage in a huge fight involving hundreds of teenagers either dressed in their Ivy League inspired Mod best or leathers rock a billy style. When played in theatres the two scenes would sit opposite sides throwing food and cat call each other during the movie when rockers and Mods got into fights. This lead to a huge surge in all things Mod in the eighties with a very loyal sub culture found all over Europe and North America. The Mods in the Eighties took the look and lifestyle from the sixties and made it their own. They formed scooter clubs and took pride in out dressing and customizing their scooters. Mods would have scooter rallies where they could display their latest accessories from coveted rare racks and lights to guardrails. Even though you would find fights amongst the clubs they would always bond together against other scenes. The guys tended to be protective of the girls in the scene. The Eighties was and era with lots of fresh and new sub cultures were emerging. If the guys saw Mod girls, even ones they didn’t know, in questionable situations they would step in. You saw a certain level of respect like opening doors and being just a little more polite than your average young guy. Not to say they were always perfect gentlemen. Throw some blues into the mix and you get some foul mouth behavior, normally only scene in the company of other Mods. The Eighties showed a different side to the Mod scene. It had military influences in the clothes and not always so focused on a polished look. Labels such as Ben Sherman and Fred Perry were still where very popular. Along side US Army issued Parkas. Women were into knee boots, flat shoes and mini skirts. Desert and Chelsea boots were also very popular. You can still find scooters clubs and the influence of the Mod culture today. Café, jazz clubs and Art galleries are the places are still places frequented. Next time you see a large group of Italian scooters outside a Café you might want to check out this still very hip scene. © 2008 Andrea Grant and Copious Amounts Press. All Rights Reserved. Advertise with Us | Sitemap | Website Designed and Maintained by Steve Castro.